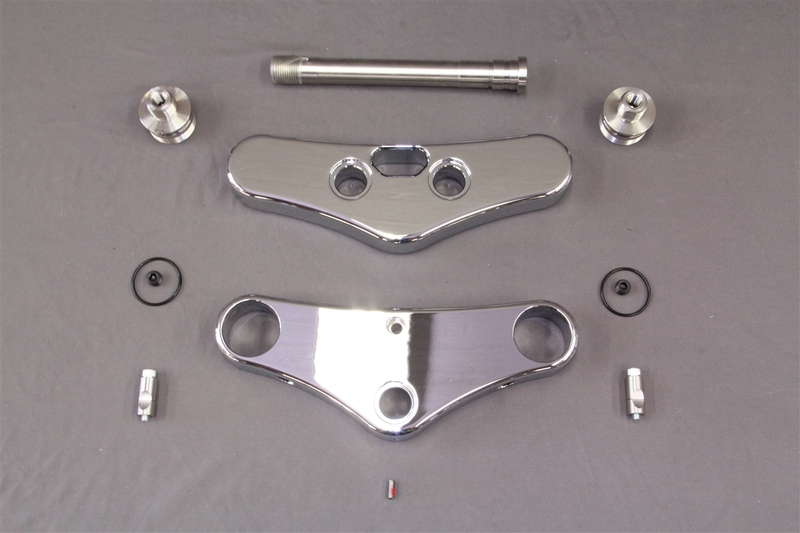 Front End Finish: Here you can choose any finish you would like, if you would like something other than what is shown in the drop down box, you can choose the "custom color" option and we will contact you once your order is placed to finalize this detail. Front End Degree: Depending on the wheel size you are riding, the degree will change. Our top priority is keeping your bike level and having the correct rake for your application. In this option (based on your wheel size you choose) these are the rakes available to you. If you would like another rake than what is shown, you would need to change your wheel size and look at our other front end kit options. Add a Wheel: Choose this option if you would like a wheel from Bitchin Seat Co. The options listed in the drop down box are only a few of many, many wheels we provide. 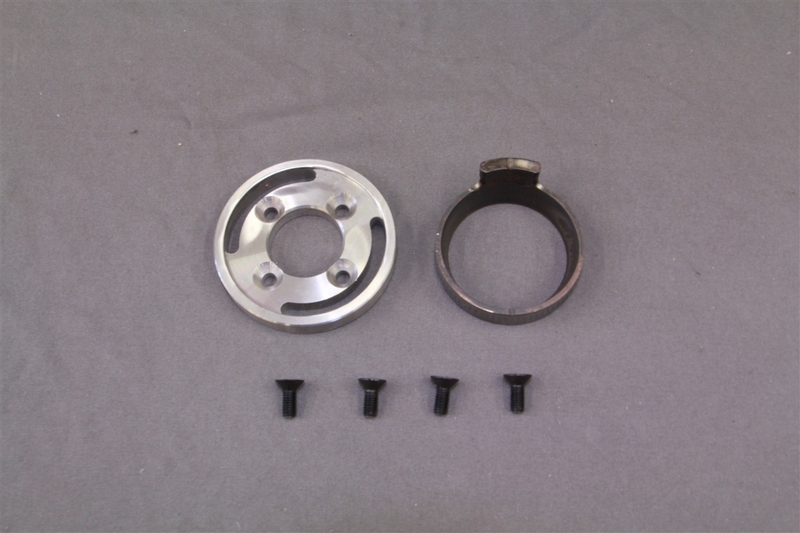 Shown is also our very popular spoked wheel. Feel free to contact us about other wheels such as Performance Machine, RSD, Colorado Customs, and completely custom deigned wheels... just to name a few. Matching Rotor: Here you have the option to upgrade from your current 11.5 stock to a much better designed rotor to match the Five Star Wheel pattern or even jump up to the larger 13.5" rotor size. If you do decide to go to the larger 13.5" rotor (great choice) and be sure to get your PM Caliper. HHI offers an industry leading triple tree product line, precision machined in our plant and then treated to a variety of show quality finishes. Our trees have a smooth top design hiding the fork tube and neck stem bolts for a true custom look. Our design utilizes hidden clamp bushings in the lower tree and a double ended insert threaded into the top of each fork tube to provide a clean, positive method of assembly. With generous corner rounding, large radius leading edges, no ball mills or logo's, our triple trees have the best look and at 1 1/2" thick give you the strength needed to provide lasting performance. HHI 49mm triple trees are available in either 3, 5 degree or 6 degree rake only. 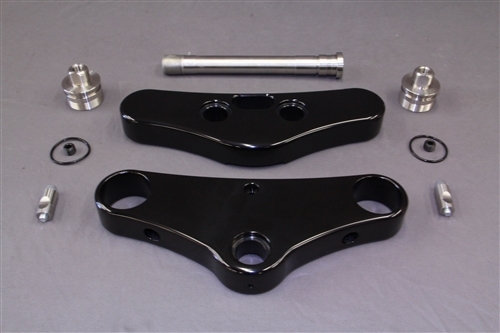 The 3 degree option works best as a stock replacement and will set the bike level using the OEM stock length fork tubes and increase the wheelbase approximately 1”. HHI 5 degree trees can be used with the stock fork tubes when a larger front wheel size is desired such as when switching from a 19” wheel to a 21” wheel. Wheelbase typically increases by about 2” with the 5 deg trees. The 49mm trees are also offered in two widths, Midglide (stock FXD Superglide, StreetBob, Lowrider) and Wideglide (stock FXDWG) / Softail Breakout, both with provision for a lower mount headlight, external fork stops and fork lock. Note: To change from a stock midglide to Wideglide you'll need a triple tree conversion kit. Trees are machined ( pre-drilled ) to accept internal fork stops.